Landlord hereby leases to Tenant, and Tenant leases and takes from Landlord, the Leased Premises subject to the conditions of this Lease. (A) The term of this Lease ("Term") shall be Seventeen (17) consecutive "Lease Years", as hereinafter defined, commencing on the effective date first listed above ("Occupancy Date"). (B) The first "Lease Year" of the Term shall be for a period of twelve (l2) consecutive calendar months from the Occupancy Date. If the Occupancy Date shall be other than the first day of a calendar month, the first "Lease Year" shall be the period from the Occupancy Date to the end of the calendar month of the Occupancy Date, plus the following twelve (l2) calendar months. Each Lease Year after the first Lease Year shall be a successive period of twelve (l2) calendar months. (C) The parties agree that once the Occupancy Date has been established, upon the request of either party, a short form or memorandum of this Lease will be executed for recording purposes. That short form or memorandum of this Lease will set forth the actual occupancy and termination dates of the Term and optional Renewal Terms, as defined in Article 28 hereof, and the existence of any option to extend, and that said option shall terminate when the Tenant shall lose right to possession or this Lease is terminated, whichever occurs first. (A) Tenant warrants and agrees that the Building has been constructed on the Leased Premises, and all other improvements to the land, including the parking lot, approaches, and service areas, have been constructed in all material respects by Tenant in accordance with the plot, plans, and specifications heretofore submitted to Landlord. (B) Tenant warrants that as of the date hereof, the Building and all other improvements to the land do comply with the laws, ordinances, rules, and regulations of all state and local governments. (C) Tenant agrees to pay, if not already paid in full, for all architectural fees and actual construction costs, in the past, present or future, which shall include, but not be limited to, plans and specifications, general construction, carpentry, electrical, plumbing, heating, ventilating, air conditioning, decorating, equipment installation, outside lighting, curbing, landscaping, blacktopping, electrical sign hookup, conduit and wiring from building, fencing, and parking curbs, builder's risk insurance (naming Landlord, Tenant, and contractor as co-insured), and all construction bonds for improvements made by or at the direction of Tenant, to the extent incurred or authorized by Tenant. (D) Opening for business in the Leased Premises by Tenant shall constitute an acceptance of the Leased Premises and an acknowledgment by Tenant that the Leased Premises are in the condition described under this Lease. Tenant shall pay to Landlord an annual Base Rent of $___________, which amount shall be payable in advance on the first day of each month in equal monthly installments of $___________. If the first day of the Lease Term is not the first day of a calendar month, then the monthly Rent payable for that partial month shall be a prorated portion of the equal monthly installment of Base Rent. (B) Annual Rent Payable beginning with the Second Lease Year and each Lease Year thereafter shall increase by an amount equal to One Percent (1%) of the Base Rent payable for the immediately prior Lease Year. Such increased Base Rent shall be payable in advance of the first day of each month in equal monthly installments. Tenant shall pay interest on all overdue payments of Rent or other monetary amounts due hereunder at the rate of fifteen percent (15%) per annum or the highest rate allowed by law, whichever is less, accruing beginning five days after written notice to Tenant that Rent or other monetary amounts properly due and payable were not paid. (A) Tenant shall, throughout the Term or Renewal Terms, if any, of this Lease, at its own cost and expense, procure and maintain insurance which covers the Leased Premises and improvements against fire, wind, and storm damage (including flood insurance if the Leased Premises is in a federally designated flood prone area) and such other risks (including earthquake insurance, if the Leased Premises is located in a federally designated earthquake zone or in an ISO high risk earthquake zone) as may be included in the broadest form of extended coverage insurance as may, from time to time, be available in amounts sufficient to prevent Landlord or Tenant from becoming a co-insurer within the terms of the applicable policies. In any event, the insurance shall not be less than one hundred percent (100%) of the then insurable value. Additionally, replacement cost endorsements, inflation guard endorsements, vandalism endorsement, malicious mischief endorsement, waiver of subrogation endorsement, waiver of co-insurance or agreed amount endorsement (if available), and Building Ordinance Compliance endorsement and Rent loss endorsements (for a period of one year) must be obtained. (B) Tenant agrees to place and maintain throughout the Term or Renewal Terms, if any, of this Lease, at Tenant's own expense, public liability insurance with respect to Tenant's use and occupancy of said premises, including "Dram Shop" or liquor liability insurance, if the same shall be or become available in the State of _______________ and liquor is sold on the Premises, with initial limits of at least $3,000,000 per occurrence/$5,000,000 general aggregate, or such additional amounts as Landlord shall reasonably require from time to time, upon Landlord's good faith determination that the present insurance coverage is inadequate, such amounts to be consistent with requirements of other Landlord's in similar circumstances. (C) Tenant agrees to notify Landlord in writing if Tenant is unable to procure all or some part of the aforesaid insurance. In the event Tenant fails to provide all insurance required under this Lease, Landlord shall have the right, but not the obligation, to procure such insurance on Tenant's behalf. Tenant will then, within five (5) days from receiving written notice, pay Landlord the amount of the premiums due or paid, together with interest thereon at the lesser of 12% per annum or the highest rate allowable by law, which amount shall be considered Rent payable by Tenant in addition to the Rent defined at Article 4 hereof. (D) All policies of insurance provided for or contemplated by this Article can be under Tenant's blanket insurance coverage and shall name Landlord, Landlord's corporate managing member and general partner, respectively, and the individual managing member and general partner, respectively, of Landlord, and Tenant as additional named insured, as their respective interests may appear, and shall provide that the policies cannot be canceled, terminated, changed, or modified without thirty (30) days written notice to the parties. In addition, all of such policies shall contain endorsements by the respective insurance companies waiving all rights of subrogation, if any, against Landlord. All insurance companies providing coverages must be rated "A-" or better by Best's Key Rating Guide (the most current edition), or similar quality under a successor guide if Best's Key Rating shall cease to be published. 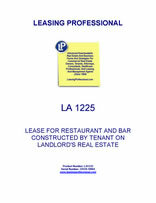 Tenant shall provide Landlord with legible copies of any and all policies on or before the Occupancy Date. No less than fifteen (15) business days prior to expiration of such policies, Tenant shall provide Landlord with legible copies of any and all renewal Certificates of Insurance, if the terms of the Policies have not changed, and copies of such policies if the same have changed. Tenant agrees that it will not settle any property insurance claims affecting the Leased Premises in excess of $100,000 without Landlord's prior written consent, such consent not to be unreasonably withheld or delayed. Landlord shall consent, where Landlord's consent is required hereunder, to any settlement of an insurance claim wherein Tenant shall confirm in writing with evidence reasonably satisfactory to Landlord that Tenant has sufficient funds available to complete the rebuilding of the Premises. (E) Tenant shall defend, indemnify, and hold Landlord harmless against any and all claims, damages, and lawsuits arising after the Occupancy Date of this Lease and any orders, decrees or judgments which may be entered therein, brought for damages or alleged damages resulting from any injury to person or property or from loss of life sustained in or about the Leased Premises, unless such damage or injury results from the intentional misconduct or the gross negligence of Landlord and Tenant agrees to save Landlord harmless from, and indemnify Landlord against, any and all injury, loss, or damage, of whatever nature, to any person or property caused by, or resulting from any act, omission, or negligence of Tenant or any employee or agent of Tenant. In addition, Tenant hereby releases Landlord from any and all liability for any loss or damage caused by fire or any of the extended coverage casualties, unless such fire or other casualty shall be brought about by the intentional misconduct or gross negligence of Landlord. (F) Landlord hereby waives any and all rights that it may have to recover from Tenant damages for any loss occurring to the Leased Premises by reason of any act or omission of Tenant; provided, however, that this waiver is limited to those losses for which Landlord is compensated by insurers, if the insurance required by this Lease is maintained. Tenant hereby waives any and all right that it may have to recover from Landlord damages for any loss occurring to the Leased Premises by reason of any act or omission of Landlord; provided, however, that this waiver is limited to those losses for which Tenant is, or should be if the insurance required herein is maintained, compensated by insurers.